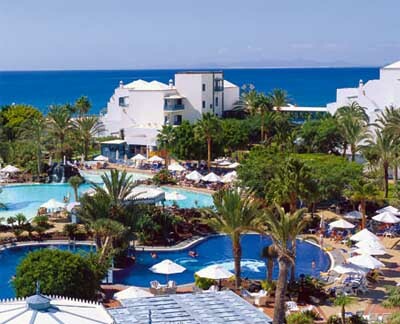 Address: Playa de los Pocillos, s/n, Puerto del Carmen (Lanzarote), Islas Canarias. Situated on Los Pocillos Beach, the Canarian-style Los Jameos Playa offers outdoor pools surrounded by palm trees and 4 tennis courts. It features a small Finnish spa with a gym, bio-sauna and Turkish Bath. Each spacious air-conditioned room at Seaside Los Jameos Playa has a balcony and is decorated with soft colours and light wood furniture. They include satellite TV, and minibars and safes can be rented. The main restaurant, with its beautiful covered terrace, offers a varied buffet dinner, with special themes and BBQ nights. The Belingo Bar offers a animated entertainment programme with live music and dancing. Los Jameos Lanzarote offers daily activities for adults and children, including minigolf and beach volleyball. There are also games and activities for children. Several bars, restaurants and shops are within 10 minutes’ walk away. Los Jameos Playa Hotel is just a 10-minute walk from Matagorda, and 2 km from central Puerto del Carmen. Lanzarote Arrecife Airport is just 5 km away. There is a golf course less than 3 km away. Extra guests can be accommodated in some room types, subject to a surcharge. This must be arranged in advance by contacting the hotel directly, using the contact details on the booking confirmation. Supplements vary according to the season, room type and meal plan chosen. Please note that a dress code applies to the restaurant. Shorts, sandals and shirts without sleeves are not allowed. Please note the hotel meal times are as follows: Breakfast- 08:00 until 10:30 Lunch- 13:00 until 15:00 Dinner (summer)- 18:30 until 21:45 Dinner (winter)- 18:00 until 21:15 Coffee, tea, cakes and crepes- 15:00 until 17:00 Please note that rooms are cleaned and towels are changed daily.